Last week, some 50 leading scientists, investors, politicians and energy experts wrote to the International Energy Agency (IEA) to make a critical ask: develop a truly Paris aligned, 1.5 degrees Celsius scenario (with a precautionary approach to Negative Emissions Technologies) and put it at the heart of their annual flagship World Energy Outlook (WEO). The letter was fundamentally important, because in energy circles, the scenarios developed by the IEA for the WEO are seen as the ”Gold Standard” in helping dictate both political and financial energy decision-making. At present, the IEA’s forecasts are fundamentally flawed, as they put the world on course for much greater warming than leading climate scientists say is safe. “Without the inclusion of a central and realistic 1.5C scenario going forward, the World Energy Outlook would abdicate its responsibility to continue to chart the boundaries of the path of the global energy sector,” the letter concluded. Campaigners argue that if this 1.5 degree scenario was adopted as a central scenario in the 2019 WEO, it would help shift trillions from fossil fuels to renewables. The letter was covered by the Financial Times, which quoted one of the signatories to the letter, Ingrid Holmes, head of policy at Hermes, which has £33.5bn of assets under management. Although the IEA did respond to the letter, it argued that it is critics were misplaced as its scenarios were already aligned with the UN Paris goals. In a response letter, Fatih Birol, Executive Director of the IEA, said that the IEA’s Sustainable Development Scenario was “fully aligned with the Paris Agreement’s goal of ‘holding the increase in the global average temperature to well below 2°C above pre-industrial levels and pursuing efforts to limit the temperature increase to 1.5°C’”. This is an argument Oil Change International and others have countered before. Ultimately, the IEA did not update its climate scenario (the Sustainable Development Scenario – SDS) to reflect the greater ambition of the Paris Agreement: the emissions profile is effectively the same as the Copenhagen-era 450 Scenario, which aimed for a 50% probability of keeping below 2°C. The SDS ignores the 1.5°C goal. 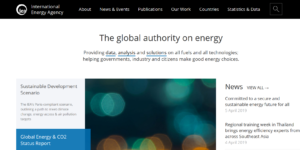 The @IEA is the world’s foremost energy authority. Its latest report #WEO2019 all but steers the world towards massive fossil fuel growth & #ClimateDestruction. The thing is, the IEA says repeatedly its scenarios are "not meant to be forecasts" and are "not normative". Yet everyone in energy & climate knows that they are frequently used as such.